We all have those nights where we don’t want to make a complex recipe for dinner. We just want three things- a meat, a starch and a veggie. The problem I have with that meal is that it ends up being so bland! This Thursday’s throwback recipe is an easy way to dress up your chicken for those kind of nights and give your dinner an original taste. I would like to thank Picky Palate for introducing me to this recipe last fall so that I can talk about it today and pass it onto you! This recipe combines delicious bruschetta with chicken and cheese to give you a brand new type of baked chicken breast. Preheat oven to 375F and spray baking dish with cooking spray. Combine ¼ cup balsamic vinegar and olive oil in a bowl. Marinade the chicken in balsamic mixture for 15 minutes. Place chicken breasts in baking dish, pour half of the mixture over the meat, and season with salt and pepper. Bake at 375F until chicken is cooked through (about 30 minutes), occasionally spooning the balsamic mixture back over the chicken. During the last 2 minutes of baking, place 2 slices of cheese over the top of each chicken breast to melt. In a large bowl combine the tomatoes, basil, garlic, a pinch of salt and remaining balsamic. Toss gently to combine. 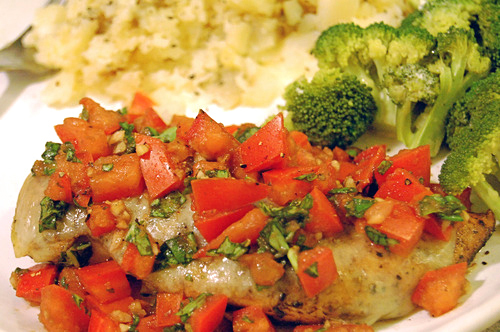 Place the chicken breasts on plates, top with tomato mixture and serve. Ohh this recipe sound so good!! !I love how it looks and photo is gorgeous!!! You are brilliant, Jenny. I have a recipe a bit like this but use wine to baste the chicken. Eureka! Instead, while the chicken is marinating in the olive/balsamic nectar, I can drink the wine! Yum! This recipe sounds good and easy! Ok….this sounds like it will be in heavy rotation in my kitchen! It’s simple, ingredients are phenomenal, its aesthetically pleasing — what more could I want?!? Thanks Sandra! looks great! I love how colorful it is–very pleasing to the eye! I’m always looking for new chicken recipes and this looks great! Will def have to try! So good! I love bruschetta, perfect for chicken! This is so creative – I really enjoy bruschetta so this is something that I’ll try to spice up my weeknight meals. Hi Jenny! Wow this recipe sounds so delicious and easy! My son loves tomato dish so I’ll have to try this! This is a lovely simple lazy dinner and right up my street. Adding the balsamic vinegar is a great touch, and I love the raw tomato dressing. Way to perk up that chicken! I love basic balsamic chicken but this ups the ante! I haven’t made balsamic chicken in a while…looks like it is time to start up again!! Um, this looks awesome!! Perfect summer dish!! Perfect dish for the (hopefully) warmer weather to come. My husband and I love bruschetta – great idea to combine it with chicken. Thanks so much! This was great but I only needed to use 1/4 cup balsamic and 1/2 a cup of olive oil to cook chicken. The recipe called for a cup of olive oil which is crazy for 4 chicken breasts! You could probably use a lot less than that even. Only used 2 tablespoons of the balsamic on the tomato mixture and I added a dash or two of virgin olive to that too. Check it to your taste. Would have been way too sour if I had used 3/4 cup plus 2 tab. of the vinegar to the tomatoes as the recipe calls for. Sorry for any confusion it was supposed to say 1/4 of balsamic, the cup of olive oil and 1/4 cup of balsamic is for the marinade. Then the remaining 2 tbsp of balsamic is for the tomatoes. I would recommend using the full cup of olive oil so that the chicken breasts can be completely submerged in the marinade.